Almost 23 percent of high school students currently use a tobacco product, according to new data published by the Centers for Disease Control and Prevention in today’s Morbidity and Mortality Weekly Report (MMWR). Of particular concern, more than 90 percent of those using a tobacco product are using combustible tobacco products such as cigarettes, cigars, hookahs, and pipes. CDC’s National Youth Tobacco Survey (NYTS) found that in 2013, 22.9 percent of high school students and 6.5 percent of middle school students reported using a tobacco product within the last 30 days. Nearly half (46 percent) of all high school students and 17.7 percent of middle school students said they had used a tobacco product at least once in their lifetime. 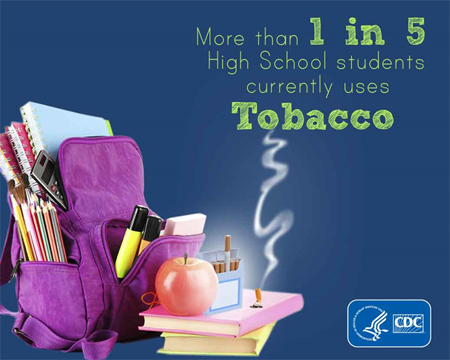 The survey also found that 12.6 percent of high school students say they currently use two or more tobacco products. Youth who say they use more than one tobacco product are at higher risk for developing nicotine dependence that can lead to continued smoking into adulthood. Most youth who use tobacco believe they will be able to quit, but about three out of four high school smokers continue smoking into adulthood. Among all high school students, 4.5 percent reported using e-cigarettes within the last 30 days; and 1.1 percent of middle school students reported using e-cigarettes in the last 30 days. While the impact of electronic cigarette use on public health remains uncertain, the 2014 Surgeon General’s report found that nicotine use can have adverse effects on adolescent brain development. Therefore, nicotine use by youth in any form- combusted, smokeless, or electronic- is unsafe. Cigarettes were the most prevalent tobacco product used by white and Hispanic high school students (14.0 percent and 13.4 percent), although cigars were close behind (11.4 percent and 12.1 percent). Cigar use was more prevalent than cigarette use for other races/ethnicities. Cigar use among black high school students was nearly 50 percent higher than cigarette use (14.7 percent vs. 9.0 percent), and more than twice as high (4.5 percent vs 1.7 percent) among black middle school students. Cigars are currently unregulated by FDA and are taxed at a lower rate. Some cigars are manufactured with fruit and candy flavors prohibited in cigarettes, and sold in small quantities with youth able to buy them at low cost. Cigarette smoking is the leading preventable cause of disease and death in the United States, killing more than 480,000 Americans each year. For every death, there are about 32 Americans living with a smoking-related disease. Besides the human cost, smoking takes a devastating toll on our nation’s economy, costing more than $289 billion a year (including at least $133 billion in direct medical care for adults and more than $156 billion in lost productivity). Today’s article is released to coincide with the 39th anniversary of the Great American Smokeout, which will be held on November 20, 2014. Surveys show about 70 percent of all smokers want to quit, and research shows quitting completely at any age has health benefits. Smokers can get free help quitting by calling 1-800-QUIT-NOW. CDC’s Tips From Former Smokers campaign features real people living with the consequences of smoking-related diseases and offers additional quit resources at http://www.cdc.gov/tips, including cessation assistance developed by the National Cancer Institute.